Will it work? Will the computer be trusted enough by the other board members to get a real vote? The computer can access and evaluate far more data than any human being ever could do. Comparing all this data and calculating the most relevant answer is one step. 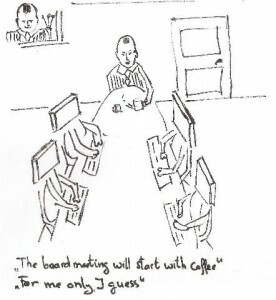 To make the computers boardroom vote count, the other (human) board members should really understand how the computer came to its conclusion. In which way computers can convince humans? Partly, humans will trust computers more and more as their lives become depended on computer systems all along. 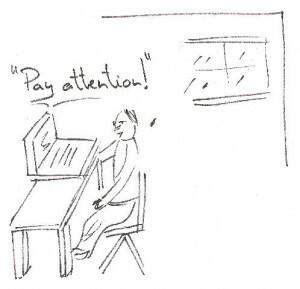 Additionally, for the more complex and high risks decisions as in a boardroom, a computer should be taught to present their results in a way that humans perceive their surroundings. Humans use metaphors to understand the world around them, as Lakoff and Johnson point out a note in their book ‘Metaphors we live by’. Metaphors visualize a comparison of known and not known, bringing up some aspects and hiding others. This way we can understand things or situations we have not seen before. I give you an example which might be familiar if you have little children. Let us assume that the first animal Tessa encounters is a rabbit and she learns that it is called a rabbit. Then, if she sees a cat, she may refer to it as a rabbit with a tail. Over time she will learn that this new animal is a different type of animal, a cat. Consequently, computers should visualize their results in accordance with the metaphors that would be understood by the other (human) boardroom members.